“Roebuck Bay Working Group in Action” » 2SER FM: Kandy Curran – Roebuck Bay Working Group Project Coordinator – talks on the proactive work of the Group. Kandy Curran, the Roebuck Bay Working Group Project Coordinator, believes that Roebuck Bay, on the shores of the rapidly growing town of Broome, is a wetland wonder in need of management, protection and scientific study to understand its complex ecology. Exceptionally beautiful Roebuck Bay with its high biodiversity and international listing as a Ramsar site, confirms its reputation as one of the wetland wonders of the world. © Rod Hartvigsen, Murranji Photography. Yawuru, the Traditional Owners of Roebuck Bay, secured an historic native title claim in 2008. As a result Yawuru are now working with the Department of Environment and Conservation (DEC) to develop management plans for Roebuck Bay. This is a great opportunity to recognise the full suite of cultural and environmental values in the Bay and provide management of a Bay with a rapidly growing town on its shores. There are few wetlands like Roebuck Bay. Coincidences of geography, history and large tides that rush in and out at speeds of up to 20 cubic metres per second on an outgoing tide, expose almost half the Bay, or about 190km2 of mudflats. The extraordinary mudflats are recognised as some of the most productive in the world, supporting a rich invertebrate community. The mudflat-dwelling critters in turn support support one of the largest aggregations of shorebirds found anywhere in the southern hemisphere. Much of the Bay is Ramsar-listed, largely due to its international importance for migratory shorebirds. The values of the Bay extend beyond birds however – the soft coastal mudflats, creeks, estuaries, mangrove forests and seagrass meadows support marine species of high conservation significance. These include dugong and dolphins, turtle and sawfish species. Humpback whales are seen in the deeper waters on their northern migration to calving grounds between Broome and Camden Sound on the Kimberley coast. There are three dolphin species known to inhabit the Bay, including Australia’s only endemic dolphin, the Australian snubfin dolphin, Orcaella heinsohni. This is the first new dolphin species to be recognised worldwide in over 50 years (Beasley et al. 2005). Other dolphin species are in decline throughout much of their range in coastal Asia due to a range of threats. Remarkably, the largest known population of this EPBC-listed Australian species is found in Roebuck Bay – 150 individuals recorded to date (Thiele 2010). The extensive mangrove communities (‘mangals’) lining its shores act as an important nursery area for prawns, mud crabs and fish (RBWG 2011). Moreover the seagrass meadows, which are an important storehouse of carbon, provide food for turtles and dugongs and protection for young fish and prawns . They also stabilise the coastline and act as a highly efficient carbon sink. 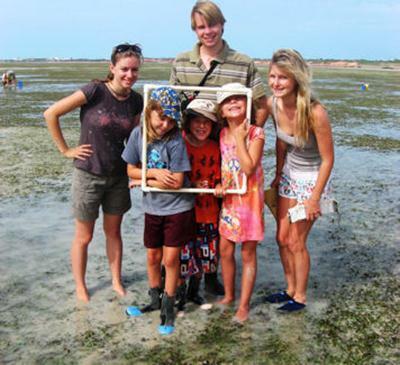 The Broome Seagrass Monitoring Project monitors the Bay’s seagrass meadows and presence of Lyngbya (smothers seagrass), to map the health of seagrass and provide data for coastal management. © F Bishop 2009. The RBWG formed in 2004 and has been involved in developing management plans for the Bay, something that is urgently needed with Broome’s rapid development. Each wet season now sees blooms of Lyngbya (or Maiden’s hair) in the Bay, so a focus on water quality is a priority. The stormwater drains in Broome are thought to be contributing to the inflow of nutrients and sediments from the town, with many older drains narrow, eroded, weedy and without structures to slow down the flow of nutrients and sediments that can discharge into the Bay in heavy rain. 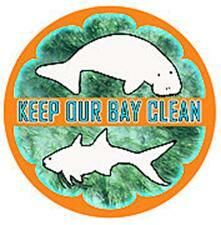 The RBWG has initiated a “Keep Our Bay Clean” project, developing bookmarks, stickers, tattoos, fridge magnets, displays and letters addressing sources of nutrient and sediment inflows. The campaign provides useful information, especially around the use of fertilisers and prevention of pollution from entering the town’s drains. Planting a native garden, for instance, foregoes the need for fertiliser, lowering fertiliser run-off into the Bay. Businesses, the Shire and schools that have large areas of lawn, are being surveyed on fertiliser use as Lyngbya thrives on the nutrient-rich run off and smothers seagrass causing a die-off. With 47 members, the RBWG together with the Traditional Owners of Roebuck Bay, the Yawuru people, have successfully included all of the stakeholders in the area, from environmentalists and government to industries such as fishing, pearling, shipping and tourism. 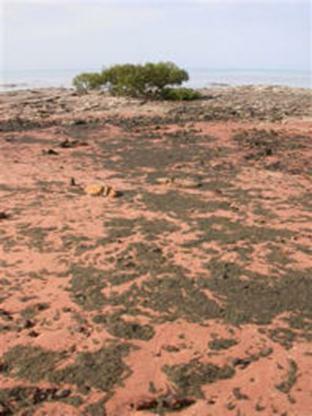 The group has made presentations to the Marine Parks Reserve Authority and Science and Conservation Strategy on the need for marine park status, written to the National Heritage Council advocating for National Heritage Listing of the Ramsar site as well as inviting scientists to consider Roebuck Bay as the site for research. Given that Roebuck Bay is internationally recognised as a Ramsar wetland and nationally as a National Heritage site, there is little doubt that protection is urgently needed. A cultural management plan has been developed by Yawuru Traditional Owners, an important step in the planning for a marine park. Yawuru have negotiated large tracts of coastal land fringing Roebuck Bay to be set aside as Coastal Conservation Estates and looked after by their own indigenous rangers, DEC and the Shire. The RBWG won a state Coastal Award in 2007 for its community efforts, a tribute to the group’s passion and diligence in developing management plans and educating the wider community about the importance of caring for Roebuck Bay. To further its reach, the RBWG has established a website with information about Roebuck Bay, its flora and fauna, the Lyngbya problem, as well as ways to help reduce nutrients from homes, gardens and schools and how to volunteer for various research activities underway, such as monitoring of seagrass, turtles, benthos and shorebirds. Despite all this activity, efforts to understand the scientific importance of Roebuck Bay are still only in the early stages. 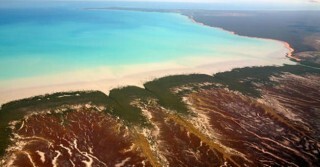 There is no scientific understanding of ocean circulation and tidal flushing, the cause of Lyngbya blooms, or longitudinal studies to understand the effects of developments, such as the proposed gas hub at James Price Point on the western side of the Dampier Peninsula, less than 50kms from Broome. The likely impacts from the proposed gas hub to the marine ecosystem include ongoing turbidity and sedimentation generated by the extensive dredging of a channel for port facilities, reclamation, pipeline and optic fibre cable laying, and dredge spoil disposal in an area of exceptionally high tidal movements. The proposed channel dredging is likely to be a continuous requirement for the life of the proposed industrial project. James Price Point 50 kms north of Broome is the proposed site of an LNG industrial hub. © 2009 Rod Hartvigsen, Murranji Photography.